A healthy and mildly-spiced Kerala style curry prepared with green gram (moong dal) and coconut milk. It goes well with chapathi, puttu and appam. 1. 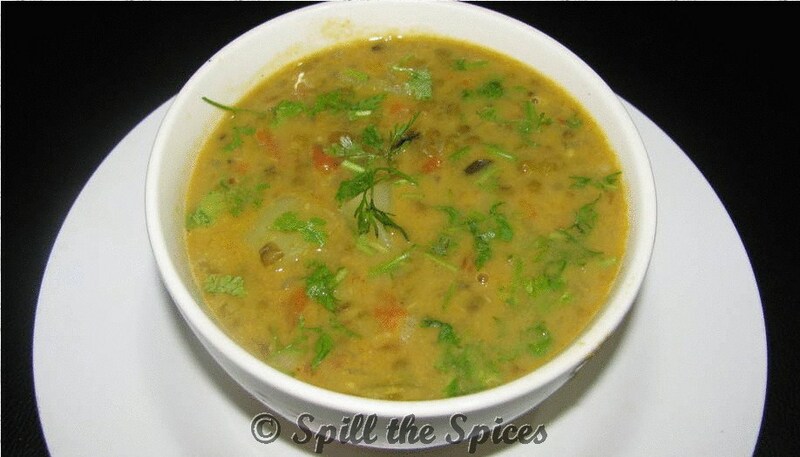 Pressure cook the moong dal with enough water and a pinch of turmeric powder until the dal is soft but not mushy. 2. In a kadai, heat oil. Add cumin seeds and when it splutters, add asafoetida, onions, ginger -garlic paste, green chillies and curry leaves. Saute till onions are pink. 3. Add the tomatoes, turmeric powder, coriander powder and red chilly powder. Mix well and fry till oil separates. 4. Add the cooked moong dal, salt and required quantity of water to make it a medium gravy. Boil for 5 minutes. 5. When boil comes, add coconut milk and boil for another 2-3 minutes. Add coriander leaves and mix well.